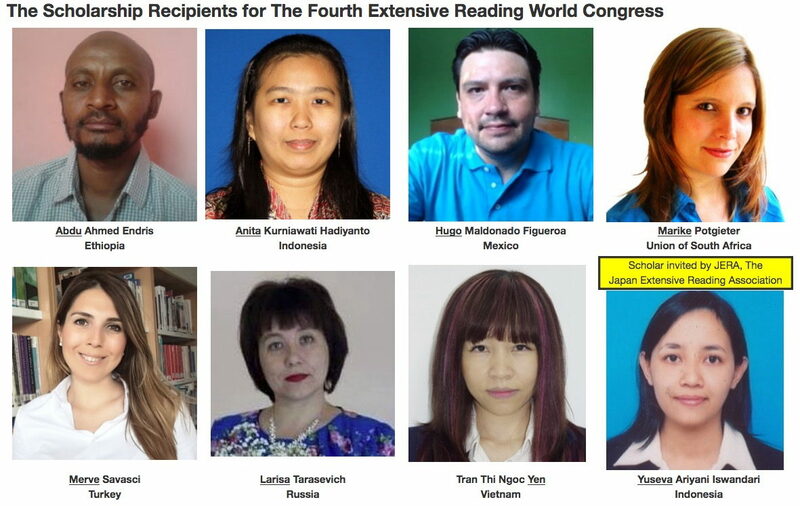 We are absolutely delighted to announce the recipients of the Fourth Extensive Reading World Congress scholarship, pictured above. The application process was the most competitive to date, with thirty-two applicants vying for just seven places. Each scholarship includes transportation (up to $1000 US), hotel accommodation in Tokyo and a small per diem allowance, and each recipient is required to participate in the colloquium entitled “Implementing ER under difficult circumstances” on the last day of the Congress, so Congress attendees will be able to see the scholars in person. An eighth scholarship with the same benefits and conditions, has been awarded by the Japan Extensive Reading Association. Many congratulations to all the scholars; it will be great to meet you in Tokyo in August!